FORT COLLINS, Colo. — A man running on West Ridge Trail at Horsetooth Mountain Park killed an attacking juvenile mountain lion by suffocating it Monday afternoon, according to Colorado Parks and Wildlife. The man, who is in his 30s, said he heard something behind him while he was running on the trail and was attacked as he turned to investigate. The lion lunged at the runner, biting his face and wrist. But he was able to fight and break free from the lion, according to CPW. After the attack, the runner, who has not been identified, was able to hike out to safety and drove himself to a hospital, CPW said. His injuries — including facial lacerations, wrist injuries, scratches and puncture wounds to his arms, legs and back — were described as serious but not life-threatening. The man was released from the hospital Tuesday morning, according to The Denver Post . He told authorities that he had researched what to do if a mountain attacked him and that he had suffocated the cat. The lion, which was less than a year old, was taken to an animal health lab for a necropsy, where officials determined that the animal had indeed died of suffocation. They said the cat tested negative for rabies. Rebecca Ferrel with CPW said veterinarians will look at the cat's body for more answers. John Demboski, curator of mammals at the Denver Museum of Nature and Science, echoed those thoughts. “Mountain lions are ambush predators," he said, adding that the runner could have excited it into a pursuit. The agency said the attack on the runner was likely triggered by the animal's hunting instincts. Wildlife officers said mountain lions will often instinctively try to chase and attack fast-moving animals, including humans. “The runner did everything he could to save his life," said CPW Northeast Region Manager Mark Leslie. "In the event of a lion attack, you need to do anything in your power to fight back just as this gentleman did." On Tuesday afternoon, CPW said the "runner is doing well considering his ordeal." Mountain lion attacks on people are rare, with fewer than 20 fatalities in North America in more than 100 years, according to CPW. Since 1990, 16 people have been injured and three people died in Colorado as a result of mountain lion attacks. Ferrel added that if you have any tools on you — like trekking poles or keys — to use those against the animal. Kelly LaPointe is a runner who often uses the trails around Horsetooth. She said she's lived in Colorado since 2002 and has only seen mountain lions on five different occasions. Most recently, she saw two juvenile mountain lions wrestling with each other on Jan. 15 near Horsetooth. She said she was near where one of the trails of Maxwell Natural Area spill onto the road when she saw the cats playing and wrestling with each other about a quarter mile away. It was between 9 and 10 a.m., she said. 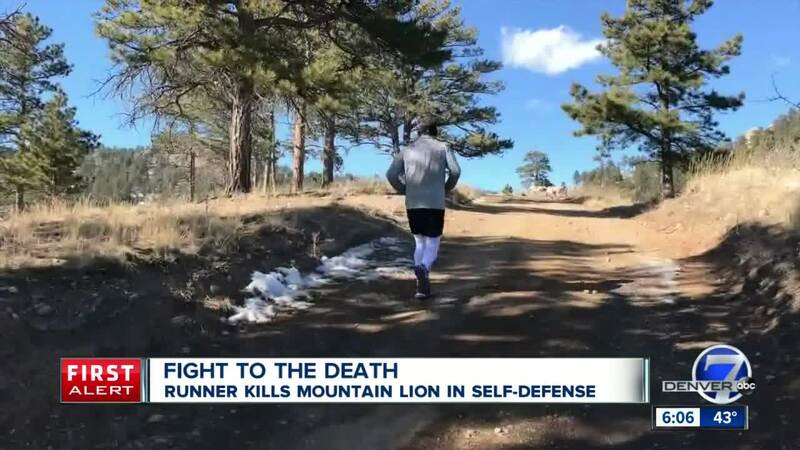 When she heard that a man had been attacked by a mountain lion in that area, she decided she would likely never run alone on the trails again, she said. The attack lifted the "weight of the silliness and guilty I felt being afraid to run alone," she said. She doesn't believe the runner did anything wrong in defending himself, she said. CPW said it is still completing its investigation into the incident. Larimer County said it has temporarily closed the open space after staff revisited the area and saw additional mountain lions. Ken Brink Jr., visitor services manager for Larimer County Department of Natural Resources, said the safety of visitors is paramount, so they will close the park and reassess the situation on Friday. "We'll reopen Horsetooth Mountain when we’ve had more time to assess mountain lion activity in the area with our partners at CPW," Brink said. Gov. Jared Polis shared CPW's tips on his Facebook page, saying "don't mess with Colorado trail runners."